Active Directory is a great feature in Windows Server. However, imagine that you stop your lab environment for several days, weeks and perhaps months. You will certainly encounter some troubles when you'll try to turn on again your DCs. In that series, I will share my own experience and show how to solve that troubles. 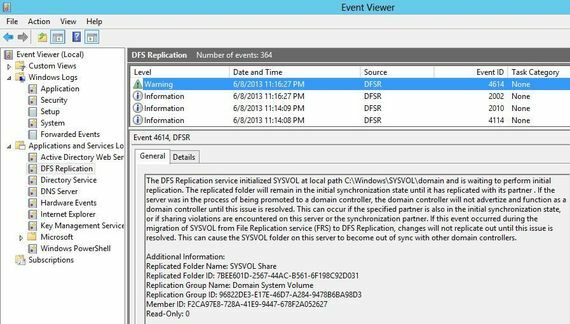 You note that replication of the SYSVOL folder between your DCs doesn't work: For example, if you add manually a file in that folder, that file is not replicated on the other DC. That problem can also create some troubles on computers if they can't download the right version of their GPO. Of course, all DCs are online and can be joined normally. 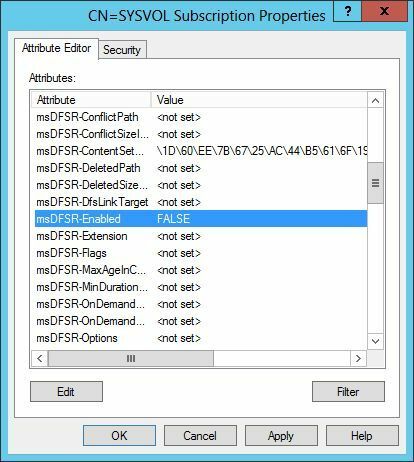 The DFS Replication service stopped replication on the folder with the following local path: C:\Windows\SYSVOL\domain. This server has been disconnected from other partners for 60 days, which is longer than the time allowed by the MaxOfflineTimeInDays parameter (60). DFS Replication considers the data in this folder to be stale, and this server will not replicate the folder until this error is corrected. To resume replication of this folder, use the DFS Management snap-in to remove this server from the replication group, and then add it back to the group. This causes the server to perform an initial synchronization task, which replaces the stale data with fresh data from other members of the replication group. However, even if you add the DFS Management snap-in on your DCs (not installed by default), you can't accomplish the actions. Indeed, the SYSVOL replication group settings are protected and provided in read-only mode. 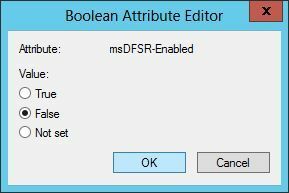 - Restart the DFSR service of the DC set as authoritative. - Restart the DFSR service. You will see Event ID 4114 in the DFSR event log. 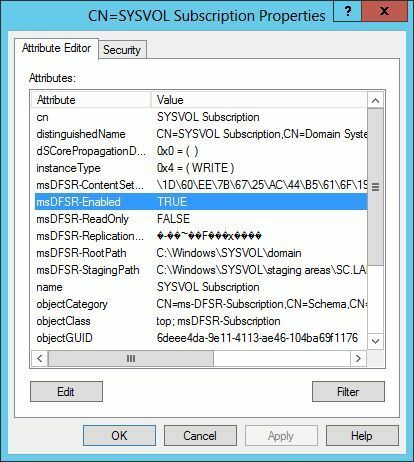 Dfsrdiag backlog /sendingMember:DC2012 /RGName:"Domain System Volume" /RFName:"SYSVOL Share"
To ensure SYSVOL replication works correctly, just create a file in the SYSVOL folder and ensure that file is replicated on all the other DCs. Great solution. Work for me, thanks a lot!